Wyoming residents, including Republican county commissioners, are contesting a proposal to lease thousands of acres of key wildlife habitat for oil and gas development under Interior Secretary Ryan Zinke’s new leasing rules. Zinke in January stripped state Bureau of Land Management officials of the power to postpone leases, a practice widely used by the agency while developing long term management plans for an area. 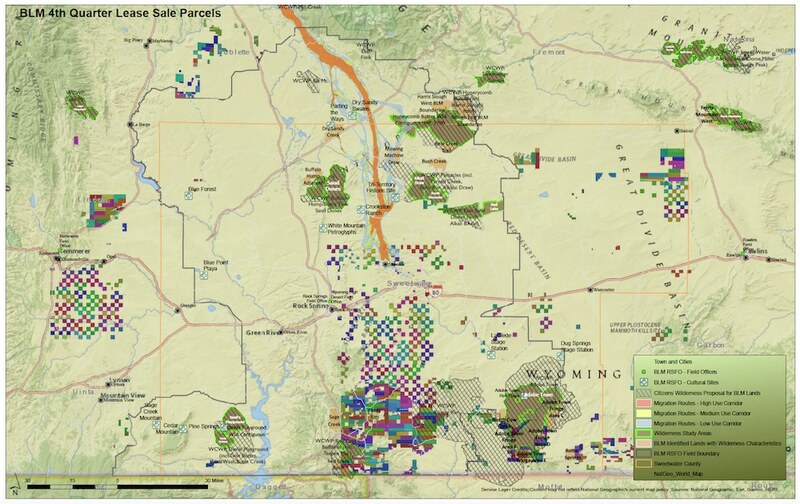 BLM Wyoming officials had previously postponed drilling activity in parts of Sweetwater County while the agency gathered local stakeholder input and rewrote the area’s comprehensive Resource Management Plan. But with a memo issued in January, “that decision now lies with Secretary Zinke,” said Tasha Sorensen, Trout Unlimited’s Wyoming field representative, and he’s implementing a faster leasing schedule. 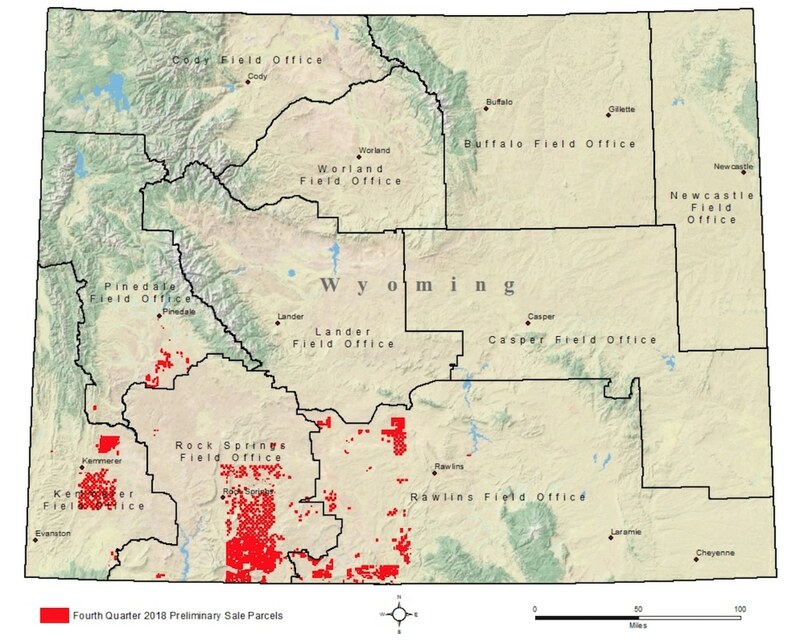 With the power shifted to Washington, the BLM is now considering leasing almost 700,000 acres in southwest Wyoming in December. Sweetwater commissioners also contest proposed leasing in the 150-mile mule deer migration route known as “Hoback to Red Desert.” Recent studies show much of that route was used by at least one deer that traveled considerably farther — 242 miles one way. The prospect of disrupting such sensitive landscapes caused grief for a county commission board that often isn’t quick to embrace conservation proposals. They voted 3-2 on March 6, for example, to recommend U.S. Rep. Liz Cheney reclassify all BLM wilderness study designations in their jurisdiction for development. The December sale, the first to be fully conducted under Zinke’s new paradigm, shows a dramatic uptick in nominations and potential leases. In the first quarter of this year, BLM auctioned 152,564 acres of leases in Wyoming that brought in $19.87 million. In the second quarter, it proposes leasing 199,298 acres and in the third quarter another 50,524 acres. That pace is expected to accelerate. For December, the BLM has proposed putting 698,589 acres up for bids. That’s three and a half times more than any other 2018 quarter’s leasing proposal and 170 percent of the year’s first three quarters combined — so far. The BLM fourth quarter list is still preliminary. The federal agency is accepting industry nominations through June 1. The fourth quarter list so far includes only parcels in one of the BLM’s three Wyoming districts. 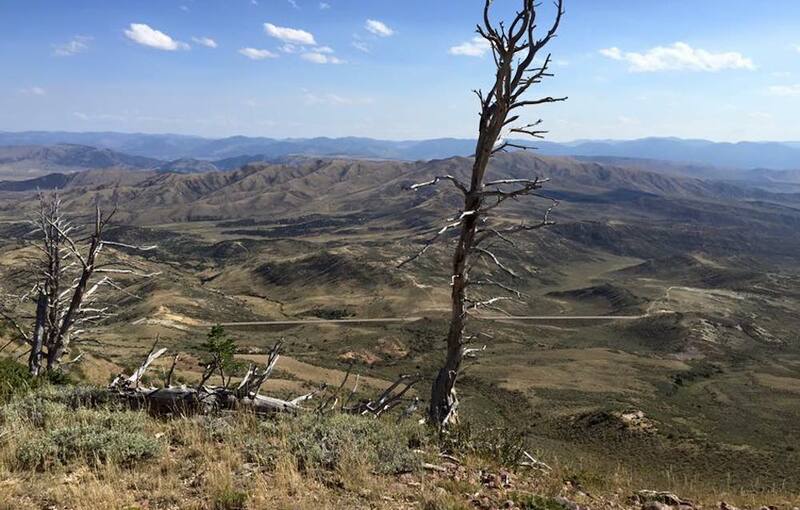 The Greater Little Mountain Area attracts much of the attention because a coalition has been working to preserve it for almost 20 years, Josh Coursey, Muley Fanatic Foundation president wrote in an op-ed on Sweetwater Now. Hunters, anglers, labor groups and conservationists formed The Greater Little Mountain Coalition in 2008 to organize local advocacy for the GLMA through the BLM’s management plan rewrite process. They aim to direct development to areas that can best sustain it while protecting more sensitive parcels. Trout Unlimited, Bowhunters of Wyoming, Muley Fanatic Foundation, the Theodore Roosevelt Conservation Partnership, United Steelworkers Local 13214 and Wyoming Wildlife Federation make up the local working group. The coalition has collaborated with industry, federal, state and local officials for years. They’ve created a brochure to tout the economic contributions of recreation, proposed and mapped six development class zones according to what development might occur there without disruption, conducted tours, held information sessions and received endorsements from the cities of Rock Springs and Green River, along with Sweetwater County. They’ve submitted their plans to federal officials from Washington, D.C. and asked that they be adopted in their entirety. Sweetwater commissioners were part of that effort in 2014, when they asked the BLM not to lease until a new plan was in place. Although the BLM’s local leaders had been able to postpone leases pending a landscape level plan for the area, “Secretary Zinke has rescinded that decision,” the Greater Little Mountain Coalition wrote Mead. “This leaves several important wildlife, fisheries and scenic areas open to being leased with antiquated [protections]” they said. Zinke is not putting the cart before the horse, “because you have an existing plan in place,” Wagner said. But Sorensen believes the cart is out front. “It seems more like a conundrum now that all that acreage has been nominated without the [Resource Management Plan] being completed,” she said. The Zinke doctrine is backward in the view of the Wilderness Association’s Harrison, too. “We should update that [resource management] plan first before we start leasing everything,” she said. An ecosystem worth of wildlife is at risk, according to Rocky Mountain Wild, a group that tracks and maps leasing proposals and their conflicts with natural values. 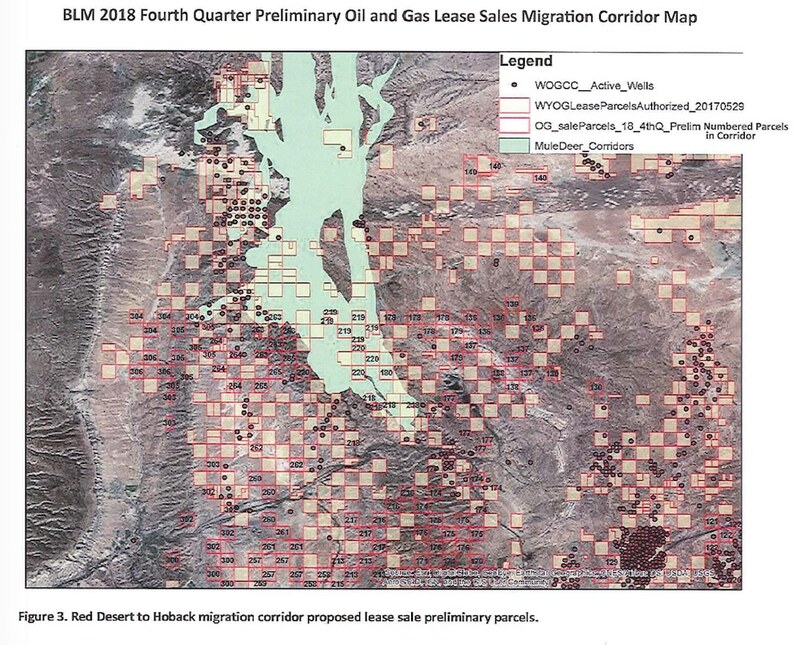 Core habitat for greater sage grouse, one of the last native bastions of genetically pure Colorado river cutthroat trout, areas identified by BLM as being of “critical environmental concern” and prairie dog colonies may be on the auction block. Leases could be sold adjacent to the Adobe Town, Red Creek Badlands and South Pinnacles wilderness study areas, the group says. Property within 10 miles of Fossil Butte National Monument could be leased along with other sensitive wild places. “These lands provide irreplaceable habitats for world-class big game herds, sources of cold, clean water that sustain important fisheries, and recreation opportunities that are a way of life for Wyomingites,” her letter to Zinke says. The BLM must perform an environmental analysis before a parcel is put up for sale, but that’s no promise of conservation. The agency rejected environmental protests against Wyoming lease sales earlier this year. “Obviously we’re aware of the issue,” Brad Purdy, BLM public affairs specialist told WyoFile. But, he said, it’s too early to comment substantively on what direction the BLM might lean. Gov. Mead is similarly restrained. “The Governor appreciates the concerns expressed in the letter,” communications director Chris Mickey said of the Sweetwater commissioners’ correspondence. “He has heard from individuals, associations and companies and there are diverse perspectives and opinions. 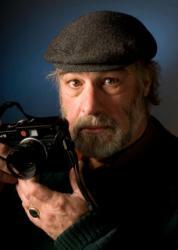 The environmental review will resolve the contentious issues, PAW’s Wagner suggested. There’s some hope from conservationists that another Zinke memo — this one touting the value of big game migrations — may reduce the negative environmental effects of the Trump administration’s energy dominance strategy. The Muley Fanatics’ Coursey painted a heartfelt picture of the challenge his coalition faces. “If the BLM follows through on this proposed lease sale, that would spell the end of the collaborative effort around Little Mountain and endanger the big game herds and trout streams that are so beloved here in Wyoming,” he wrote in his opinion piece. “The desire to catch a trout in the high desert or draw a cherished elk or mule deer tag is strong. The desire to keep a piece of country as wild as it was when your grandfather hunted it is stronger than any political swing. The entire Trump administration is trying their hardest to destroy America. People, wake up! We need to protect the lands for our future generations to come and fish, hunt, camp and explore. Once these lands are sold or leased for development, there will be less access for outdoor activities and less habitat for animals. Though surprising in the vindictive, anti-science, anti-stewardship scope, this is just what we are becoming numb to by the republican appointees of this administration (so much for the “more local control” charade.) Zinke has been given a pass to avoid such actions in Montana where he will likely be running for office, but is doubling down on neighboring (red) states where there will be no consequences or backlash. So, the question is: how can we create consequences? (Apart from not voting a straight R ticket, which is just a bridge too far…) Jim Hightower always ends his pieces with a footnote about who to contact, but in this & all instances in Wyoming that would mean contacting our “representatives” with our objections. How’s that been working for us lately? Check Pete Jorgensen’s reply to this week’s Drake’s Take for the answer. What is left? Well, it ain’t what I’m singing here, dear choir members. I am thinking about running for county commissioner, how about you? In Colorado they are effectively making good, county-based (oh dear: ZONING!) protections on landscapes/wildlife habitat/watersheds that the locals most value. We may not get many votes, but it might at least raise the issues. Are we brave, mad or fed-up enough?